It’s Volunteers’ Week on the 1-7 June 2018 and we’d like to take the opportunity to say thank all our staff for their fantastic contribution they make helping local charities in our communities, from those of you who are trustees and campaigners to carers and fundraisers……thank you! In 2017 we had runners take part in Race for Life, Great North Run, London, York and New York Marathons, Liverpool Half marathon, even ran around the res, staff jumped out of planes, cleaned canals, baked cakes, climbed the Three Peaks, collected Easter eggs, donated food and school uniforms, dressed up, dressed down, delivered meals to the elderly, wore red noses, ducked for ducks for Children in Need, got elfed for Alzheimer Society, got muddy, played golf, and went pink for Breast Cancer Awareness and donated over 500 hours to volunteering at local charities. Claire Richardson volunteers with Hoot Creative: " HOOT Creative Arts is an Arts Council England National Portfolio Organisation and the provider agency for the Kirklees Arts & Mental Health Service and is currently working in, or has specialisms in the following settings:- adult Mental Health services, older people living with dementia, end of life service, prison, young people’s projects, community arts projects and workplace team building. As a small local charity and employer they have limited access to HR advice and guidance. I was asked to offer my time and experience assisting one of the directors. We meet once a month for just an hour, where I offer guidance or sign post them to additional resources and hopefully reassurance that they are on the right track. It can be tricky for small organisations without dedicated HR support to know whether or not they are making the right decisions, or following the right procedure. And the funds are not always there to purchase this service. I’m really happy to help them out this way." Jaynie Broughton and Helen Thewlis volunteer serving breakfasts with the Huddersfield Town Foundation. Jaynie commented: “I find it extremely rewarding to support the breakfast club, the children are brilliant and it is great to interact with them and a fantastic way to start the day. The staff really appreciate the extra pair of hands so it feels as though you are giving something back and supporting the school." Jodie Wielgus is a trustee at Overgate Hospice and says: "I am exceptionally proud to be on the Board of Trustees at Overgate Hospice. The role enables me to use my industry related professional skills to help a cause that is close to my heart and very well respected in the local community. Being a volunteer is rewarding on a number of levels; not only do I have a sense of pride for being involved in such an incredible cause but the Trustee role enables me to broaden my skill set and work upon existing ones. I am excited to be working with the Hospice on their future plans and actively encourage anyone to get involved in volunteering on any level." Stephanie Bradley volunteers serving meals with Slaithwaite Meal on Wheels to the elderly in the community: “I volunteer at Meals on Wheels as I have a passion for helping the elderly and really feel that if I have the ability to give back, I should. Especially to a community where I have worked for many years and spend a lot of my time. I love the service that Meals on Wheels has to offer and whilst my contribution is only a small part of a much bigger picture, it gives me the opportunity to get involved within the local community and help those who may need a little extra help”. Michael Robinson is a trustee at Calderdale Transport: “As we live in such an outstanding part of the world, with rolling hills and magnificent views, there is always going to be people who live in remote areas. Community Transport Calderdale (“CTC”) is an extremely important link to residents of Calderdale and Kirklees, who need that helping hand with the little things in life and the support provided is a lifeline to those who use it. As a Trustee for CTC, I feel I can put my skills I have gained towards helping this charity move forward in what they want to achieve for the communities and the residents that live here. I think being a Trustee for CTC allows me to support the area in which I live and work in. My Trustee role resonates with me in connection with my work as a Private Client Solicitor, as I administer estates where individuals have sadly passed away without leaving a Will and many of these individuals may have just lost contact with their families, or, may have just kept themselves to themselves. I would hope that supporting this charity gives residents in the areas covered, the opportunity not to be cut off from living their lives and reconnect with friends and families, who they may have possibly lost contact with if they didn’t have the transport available. 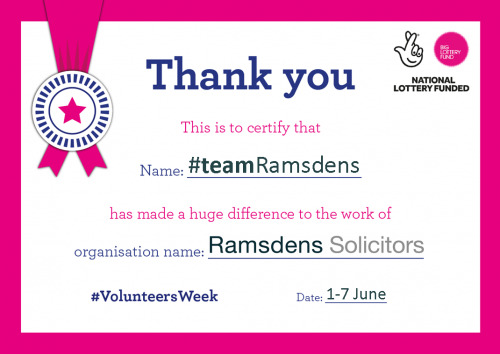 To find out more about Ramsdens Corporate Social Responsibility strategy click here or follow @RamsdensCSR on Twitter.